Has completing a triathlon been in the back of your mind, but you haven’t signed up? Do you say, I’d love to do a triathlon one day? Let’s make one day today. There are always reasons to start something one day in the future. These reasons make us put off things we really want to do, until later becomes never. “I can’t – Its too hard” – If you are in a general state of good health, you can train for and complete a triathlon. Its just takes a little knowledge, and some quality training. Choose a good training plan, that fits into your lifestyle, and will get to race day ready. What you should say is I can’t right now. Training for a race will get difficult at times. There may be times when you really think you can’t. These are the times when you can dig deep and make a breakthrough. The more you struggle and persevere, the sweeter the reward. “I’m not fit enough” – You may or may not be fit enough to finish a triathlon right now. That’s why proper training is so important to make sure you are fit enough. Athletes of all sizes and ages complete triathlons. If you wait until you are fit enough, it may never happen. “I don’t have the time” – Everyone is busy. You may not have the time right now with your current schedule. You have to make time for things you want to do, and will make a positive impact on your life. If you are really honest with yourself, you have more time than you think. There are 168 hours in a week. Can you spare 6-5 hours to train? You can get up an hour earlier, and fit in a run. You can swim at the YMCA during lunch twice a week. Pay yourself first with your time, and invest in your health and wellness. “I’ll embarrass myself” – When is the last time someone was challenging themselves to try new things to better their lifestyle, and you laughed in their face? I am going with never. Most people respect others who are trying to improve themselves with new exciting goals. Put yourself out there, and others will admire your courage to try new things. Link: Fantastic Finish Fridays. Stories from new triathletes that overcame fears to finish their first triathlon. “Triathlon is too expensive” – Triathlon can be an expensive sport, but you can get started for less than you think. Try out your first race with some borrowed equipment, and see how you like it. If you get hooked, then you can invest in better equipment. “I don’t have the equipment” – If you look in your garage right now, you probably have almost everything you need for your first race. You only need a bike, helmet, goggles, running shoes and something to wear. All of the other accessories like GPS watches, race belts, and compression sleeves, aren’t necessary. Keep it simple for your first race and have fun. Totally agree! You can overcome all those obstacles by just doing it and preparing yourself. 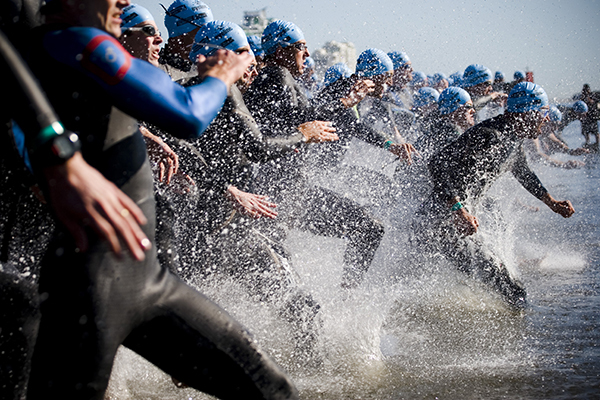 No you can’t do an triathlon right now but with the training you certainly will. Just believe in yourself and make it happen 🙂 Great blog! All the imaginary reasons why you think you can’t with the logical reasons why you can!